A Waffle House on state highway 421 says they would be open through Hurricane Florence in Wilmington, North Carolina. Waffle House is one of few businesses that usually remains open during natural disasters. That's because the 24-hour restaurant chain is known for more than a fast breakfast — it often remains open during natural disasters, providing food and resources to first responders. 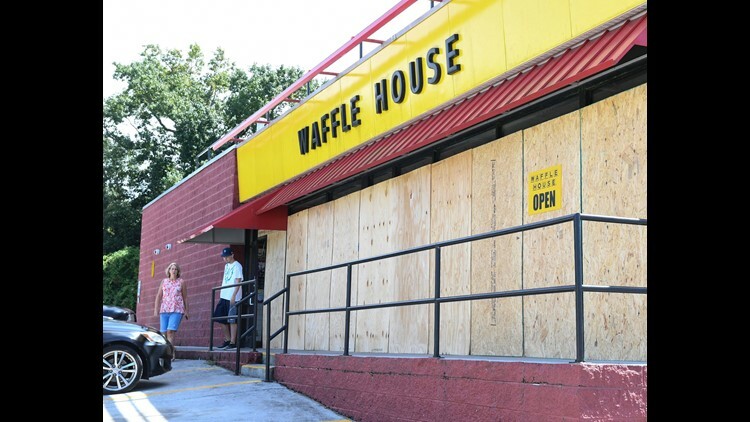 The Federal Emergency Management Agency even monitors a "Waffle House Index," a color-coded indicator of what restaurants are open, closed or offering a limited menu, to gauge how well an area will recover from a hurricane, tornado or other hazard. "The Waffle House test just doesn't tell us how quickly a business might rebound – it also tells how the larger community is faring," a FEMA blog post from 2011 states. "The sooner restaurants, grocery and corner stores or banks can reopen, the sooner local economies will start generating revenue again – signaling a strong recovery for that community." Tuesday, Waffle House announced its Storm Center was active and monitoring Florence. The team also asked people to "plan ahead and be safe." Florence has diminished to a Category 2 hurricane but is still considered "life-threatening," according to the National Weather Service. More than a million people have been evacuated from the projected path of the storm, set to make landfall along the Carolinas early Friday.